A couple moves from Berlin to a village looking for a more meaningful life. 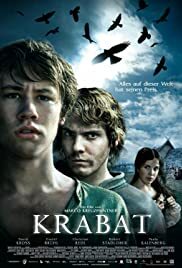 "Krabat" has been one of the classics of youth literature in Germany for almost 40 years and one wonders why nobody tried to make a movie out of it earlier. Actually, it is not that hard to answer this question since "Krabat" is a very grim and dark tale with some gruesome deaths, an ending that comes across as rather anticlimactic and above all an incredible amount of religious symbolism (even though the book is no sappy Christian novel) that would make it hard to market it. Parents would not go and see this movie with their kids and young people might not find it cool enough. Fortunately, the producers were smart enough to think of another target group: grown-ups who read the book in their youth and have been haunted by it ever since. Some changes have been made. The symbolism is reduced, the role of the "Kantorka" is slightly expanded, which makes the showdown a little more exciting and Tonda's love to Worschula plays a bigger part than it does in the novel. Make no mistake, though, both women still have small roles. The story is shortened by one year (so that it now covers only two years instead of three which ultimately saves the life of one of the boys - and to those who only watched the movie but haven't read the book: It is not the guy you think it might be) and the story centers even more on Krabat than in the book, which means that all scenes that explain more about the master such as the sorcerer's duel and the trip to the Elector in Dresden were left out. I don't mind these changes too much. While the trip to Dresden was in my opinion one of the most memorable scenes of the book I can understand why it had to go. There are some other minor changes which I won't go into. But even with the shortening of the story, Kreuzpaintner still had a lot left in his hands that he had to press into two hours. And I have to say that he does not entirely succeed. Kreuzpaintner does something Preußler does a lot in his book: He only hints at many things and hopes that the viewer will link the parts together. But Preußler had a much bigger story than Kreuzpaintner does and often this makes the movie feel rushed or incomplete. But still, the story is touching and gripping and in my opinion totally satisfying. The cinematography is outstanding. The images are truly beautiful, and the aerial shots even allow the viewer to see the entire set. Incredible work has been done here. Now, in most big German productions there is one scene in which the director decides to go totally Hollywood and usually this ends in a disaster. The same thing unfortunately happens here when the boys get into a fight with some marauding soldiers. Kreuzpaintner tries to out-Scott Ridley Scott here and the picture is so distorted that not only can you barely see what is happening but it also really hurts the eyes. What makes this even worse is that this makes it look like they tried to cover up bad fighting stunts with these scenes even though I am sure that they were in fact done well. The actors are mainly well cast. Brühl, Redl (especially Redl! ), Stadlober all act well and make us forget the actor behind the role (Brühl and Redl succeed better than Stadlober) Hanno Koffler, whom I usually like a lot, does some over-acting which seems annoying at first, but since he plays Juro that might have been a deliberate choice. Unfortunately, David Kross is a little weak, but this seems to be the curse of title characters who, after all, are supposed to serve as models for identification. The guy I actually liked best was Moritz Grove, who plays Merten as thoughtful, caring and in the end almost tragic. All in all,it has to be said that the casting agents really did their job well in making these guys distinguishable, even though some of their parts are rather small. While I liked the set design and the costumes, I was not too pleased about the make-up. Smeering some black paint on strategic places on the actors' faces so that they look dirty but still pretty gets on my nerves when it happens through an entire movie. It really looks fake after a while and when you get to scenes where the actors show their shaved armpits, you cannot help but laugh at this pseudo-historical mess. I have to say, in spite of some criticism I really liked the movie and I will recommend it to everyone. To people who read the book it will bring back great childhood memories and others who have not read it will find the movie entertaining, thrilling and maybe even scary. But just like the movie ends on a big "f--- you" to the audience I will end this review with my biggest gripe about the movie: Who on earth made the decision to put such a terrible song at the end of the movie? The picture has such an incredibly beautiful score and does everything to set the mood right and they actually decide to put some electro dance track over the credits!!!! This must be one of the worst choices of a film-promoting song in film history! The people behind this decision should really lower their heads in shame!